Composting is an ex situ technology for treatment of excavated soils impacted by recalcitrant contaminants, including nitroaromatic and nitramine explosives. The process involves mixing contaminated soil with bulking agents (wood chips, straw, hay or alfalfa), and organic amendments (cattle and/or chicken manure, other vegetative wastes). Ingredient selection depends on the contaminants to be treated, soil characteristics, and availability of low-cost organic amendments. 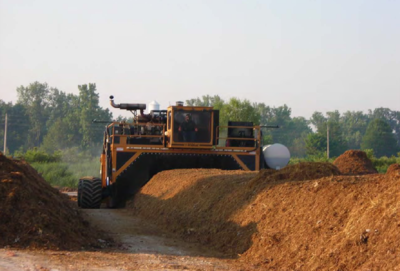 Advantages of windrow composting include more rapid degradation of explosive compounds, end-product reuse, applicability to a wide range of soils, self-heating treatment process, and year round operation without external heating. Cost drivers include land requirements, treatment batch size, venting requirements, soil characteristics, nutrient and bulking agent addition, and turnover frequency. ACOE (2011) Soil Composting for Explosives Remediation: Case Studies and Lessons Learned. Composting is an ex situ technology designed to treat excavated soils impacted by a range of recalcitrant contaminants, including nitroaromatic and nitramine explosive compounds. The process involves mixing contaminated soil with bulking agents such as wood chips, straw, hay or alfalfa, and organic amendments such as cattle and/or chicken manure, or other vegetative wastes. The selection of specific compost ingredients depends on the contaminants to be treated, the physical/chemical characteristics of the soil, and the availability of low-cost organic amendments. The goal is to achieve the desired bulk density, porosity, and organic amendments that can provide the proper balance of carbon and nitrogen (C/N ratio) to promote biological activity in the compost. For most composting applications, it is necessary to provide amendments that will support mesophilic or thermophilic microbial activity. Composting is a biological remediation technology that exploits the activity of a diverse range of microorganisms to degrade target contaminants. The biological activity is enhanced through the addition of readily degradable amendments to provide a sufficient supply of nutrients. As biological activity increases, compost temperatures reach mesophilic (<45°C) and potentially thermophilic (45° to 80°C) conditions, the latter of which experiences the greatest degradation. Turning, mixing, and/or aeration of the compost provides oxygen for extracellular hydrolysis and aerobic catabolic reactions to take place. However, a high level of microbial activity can deplete oxygen between turning or aeration sequences, creating anoxic conditions in portions of the compost material that allow anaerobic catabolic reactions to occur. Formation of anoxic zones in the compost can be beneficial for promoting degradation of contaminants such as explosives that are recalcitrant or only partially degrade under strict oxic conditions. For contaminants that are readily mineralized under oxic conditions, the development of anoxic conditions is not desired, and turning, mixing, and/or aeration frequencies are adjusted to minimize oxygen depletion. Figure 1. Compound reductions for different composting techniques using soils from contaminated ammunition production sites. Error bars are ± 1 standard deviation. IVSP = in-vessel static pile; MAIV = mechanically agitated in-vessel. Data compiled by Bruns-Nagel et al. (2000). The initial proof of concept and scale up from laboratory to pilot scale tests for composting explosives contaminated soils and lagoon sediments began in the 1980s. Early data had promising degradation results (92% to 97%) for a range of explosives including TNT, RDX, HMX, and tetryl, but soil loading rates were low, generally 10% or less in the compost mixtures. Subsequent pilot scale treatability studies were conducted to evaluate mesophilic vs. thermophilic conditions. A range of materials handling approaches including static piles, mechanically agitated in-vessel reactors (MAIV), and mixed aerated and nonaerated windrows  were tested at Louisiana AAP (LAAP) and Umatilla Army Depot (UMDA) (see Fig. 1). TNT degradation was similar in aerated and nonaerated windrows, but RDX and HMX degradation were greater in mixed unaerated windrows at 30% soil loading rates. Based on the results of these treatability studies, windrow composting was selected as the preferred technology for treatment of 15,000 tons of explosives contaminated soils from a washout lagoon at Umatilla Army Depot, in lieu of incineration (Fig. 2). Composting has been used to treat explosives contaminated soils at 10 additional Army Ammunition Plants (AAPs), Army Depots, and Naval Ammunition Depots (NADs) in the U.S. for soil quantities ranging from 1,000 cubic yards to greater than 200,000 cubic yards. Fifteen additional sites have soil explosives contamination quantities ranging from 1,000 cubic yards to 55,000 cubic yards. Figure 2. Key steps of windrow composting process at UMDA including: excavation of contaminated soil to 15 feet below ground surface (left), loading windrow machine with soil and amendments (middle), and periodically turning the windrows (right). Figure 3. Windrow Turner at Plum Brook Ordinance Works. Implementation issues include amendment selection to promote thermophilic conditions, moisture control in the windrows to maintain optimal moisture levels, and frequency of windrow turning to optimize solid phase mixing, oxygen levels, temperature control, and explosives degradation kinetics (see Fig. 4). Figure 4. Degradation kinetics of three munitions contaminants in two UMDA windrows (modified from: Weston, 1993). Composting consumes approximately 1 gallon of water per cubic yard per day during the active treatment phase, and water must be added throughout the treatment process to maintain optimal moisture levels. The median degradation for explosives composting at 10 sites was 99.7% and unit cost for composting treatment was $281 per cubic yard, which was approximately 50% lower than the estimated costs for on-site incineration treatment. The treatment process is self-heating, therefore can operate year round without external heating. The contaminated soil in the compost mix is limited to approximately 30% by volume to achieve self-heating thermophilic conditions. Composting is less land intensive than land treatment, but still requires a moderate treatment footprint. Batch treatment size will impact the number of batches required - windrow widths and heights are limited by the size of the turning machinery and windrow lengths by the size of the buildings used. Volatile emissions, primarily ammonia, may require venting. Soils with low porosity may require bulking agents to increase the airflow through the compost pile. Soil screening may be required to remove large rocks, debris, or other oversize materials. Composting may require nutrient amendments to optimize C/N ratios and water, in addition to bulking agents. Operations and Management (O&M) considerations include turnover frequency, moisture levels, nutrient levels, and use of bulking agents, such as wood chips or sawdust, to maintain optimum conditions for degradation. The need for containment structures also affects treatment costs. Windrow composting has typically been conducted using open windrows in arid climates (see Fig. 3), but enclosed structures in temperate and northern climates. This page was last edited on 12 February 2019, at 21:01.